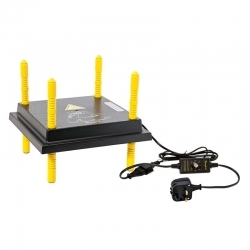 A Chick Heat Plate for up to 35 chicken chicks & only 42 watts with Adjustable regulator. 40cm x 40cm on Fully Adjustable Legs make this electric hen ideal for medium clutches. A heating plate is a substitute for Mother Nature, where the hen keeps the chicks warm under her feathers. It is a very natural solution with a big advantage in that the chicks will harden earlier and also the growth of their feathers will be quicker. The lifetime of a heating plate is usually 10 years when minded and the chance of malfunctions is minimal. A Regulator is available to make this brooder even cheaper to run. At todays electric prices this chick brooder will cost approx € 1.60 per week to run. Suitable brooder for all farm fowl. Ideal for game bird chicks & quail. Big Red Grit Station. Grit Hopper. 24 Egg Incubator Automatic Turning. Borotto Real 24. 49 Egg Incubator Automatic Turning. Borotto Real 49. © Copyright 2019 Mac Eoin General Merchants Ltd. . All rights reserved.